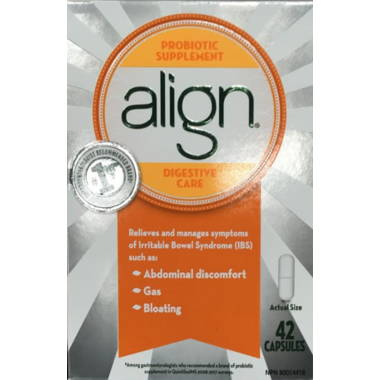 Align is a daily probiotic supplement that relieves and manages symptoms of Irritable Bowel Syndrome and forms part of a natural healthy intestinal flora. Common issues such as diet, changes in routine, travel and stress can disrupt your natural healthy intestinal flora. B. infantis 35624, only found in Align, is a patented probiotic that provides live bacteria that form part of the natural healthy intestinal flora. Align Probiotic Supplement relieves and manages symptoms of Irritable Bowel Syndrome such as: abdominal discomfort, gas, and bloating. Medicinal Ingredient (per capsule): Bifodobacterium longum subs. infantis 35624 (Bifantis (TM)) 1 X 107 cfu/capsule. Non-medicinal Ingredients Microcrystalline cellulose, hypromellose, sucrose, magnesium stearate, sodium caseinate, titanium dioxide, trisodium citrate dihydrate, propyl gallate. Contains: Milk. Align contains an effective level of probiotic bateria throughout the shelf life of the product. See carton bottom for expiry date. Directions: Adults and children over 12 years: Take one capsule per day. Store at room temperature. For best results we recommend you store Align in the original blister package. Cautions: Keep out of reach of children. In case of accidental ingestion, contact your doctor or a Poison Control Centre. Do not use if you are experiencing nausea, fever, vomiting, bloody diarrhea, or severe abdominal pain. Do not use if you have an immune-compromised condition (e.g., AIDS, lymphoma, patients undergoing long term corticosteroid treatment). Consult a doctor if symptoms of digestive upsets do not improve, or persistently worsen. Other Information: You may experience temporary changes in bowel habits as you begin probiotic supplement intake. Carton sealed for your protection. Do not use if capsule blister unit is open or torn. Have purchased this product twice now and seems to be helping me with all my â€œgastro issuesâ€� I will continue to use this product! Best probiotic if you suffer with IBS. Love this stuff. And also love how fast it arrives at our home. Have tried most probiotics. Align is a keeper. Its single strain formulation (b. infantis) works for me. Your mileage will vary of course, but you have to give your system a couple of weeks to adjust. Been taking this for a week so far to try to decrease bloating along with eliminating refined sugar. Have not experienced any adverse effects. No noticeable decrease in bloating yet though.. Happy with how this product is helping my "system". Its become part of my daily vitamin/supplement regime. I tried Align on my doctor's recommendation. It is an excellent product. It reduces gas, bloating and general abdominal discomfort. My order was received promptly and in good order. My doctor recommended this product for my IBS symptoms and I noticed an improvement right away. This website has a great price and it's convenient to have it delivered right to my office. Great product! has saved me from issues since I began using it! This is a great product, I have tried everything to help with my IBS, a couple weeks on this and I am so much better. I will not stop taking this product as it works so well. I have been using align for a few months now. I have found a change. Foods etc that use to react to my system is much more under control now. I try to stock up when Well.ca has it on sale since it is a bit pricy. Which is the only down fall. This definitely helps with my IBS but I still have to be careful what I eat. Probiotic yogurts didn't do anything for me. This probiotic works for me. I suffer from irritable bowel and one pill every night keeps everything under control. My son started taking this for his IBS-D which was a huge problem, and it has really helped-first thing that we tried that did! This product has definitely helped me. I'm so glad it was recommended by my doctor! This is one of the better probiotics that I've tried. I have a very sensitive digestive systems and in the past, other probiotics have caused me heartburn and bloating. Align doesn't do that, in fact it seems to help relieve these symptoms! I've found it very helpful after many other options like fibre, peppermint oil, and dietary changes didn't work. I absolutely love this product. It is great for IBS. I started using this probiotic daily and so far i have been satisfied. But I have tried other probiotics that alleviated my IBS symptom better than this.